Axe the Act and the Unite Housing Workers Branch have organised a meeting open to all housing association workers and residents to develop a network for greater campaigning strength. 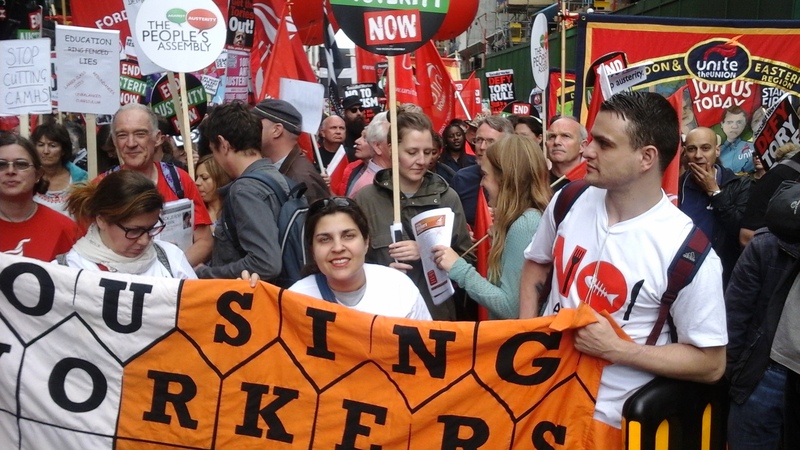 As with public services, to defeat the Housing and Planning Act and the austerity agenda, workers and service users must come together united in a common cause. The event flyer is now available here - please copy and circulate as widely as possible. Please confirm your attendance by email here or via Facebook here. Housing associations have great wealth – they have benefitted financially from a very favourable economic climate. Associations have accumulated stock of almost 3 million homes worth almost £139 billion. They generate surpluses of £3 billion in a single year. Financial failure is almost unheard of. Yet residents and service users are told to endure cuts to their repairs programme, cuts to support services, and increased service charges. Staff are expected to work harder for less pay and reduced pensions. They are under ever increasing performance pressure, and are of course told to be grateful they have a job at all. Defeat the remaining parts of the Housing and Planning Act. Unite behind a Manifesto for Housing. End ‘social cleansing’ and homes for investment – housing for those in housing need. End the cuts to repairs and maintenance services – provide the jobs and services that are needed. Demand decent pay, conditions and training for housing workers – recruit and retain staff to deliver good quality services.